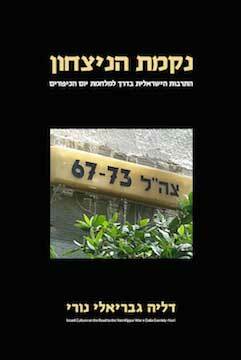 NIKMAT HANITZACHON: HaTarbut HaYisraelit Baderech L’Milchemet Yom HaKippurim (Israeli Culture on the Road to the Yom Kippur War) takes a new approach to understanding that period in Israel’s history that led to the Yom Kippur War. Probing Israeli culture during this period enlightens readers regarding aspects of Israel’s society that have not been sufficiently examined to date. Dr. Gavriely-Nuri’s analysis of Israeli culture between the Six Day War and the Yom Kippur war makes an important contribution to our understanding war discourse in general, and to the normalization of war in post–1967 Israeli culture in particular. In this new book, Dr. Gavriely-Nuri provides valuable insights into how the 1973 Yom Kippur War could have been such a surprise. Her application of scientific methods from the field of cultural studies to topics that are normally perceived as belonging to the strategic sphere exclusively is an additional important contribution to the field. Dr. Gavriely-Nuri employs an innovative methodology to explain the concept of “strategic surprise” by expanding her research past the narrow military arena, and into a larger investigation of popular Israeli culture. In NIKMAT HANITZACHON, Dr. Gavriely-Nuri demonstrates how the normalization of war discourse established in Israel before and after the Six Day War developed into a dominant national narrative.